Stripes! Vila Madalena, April 2015. 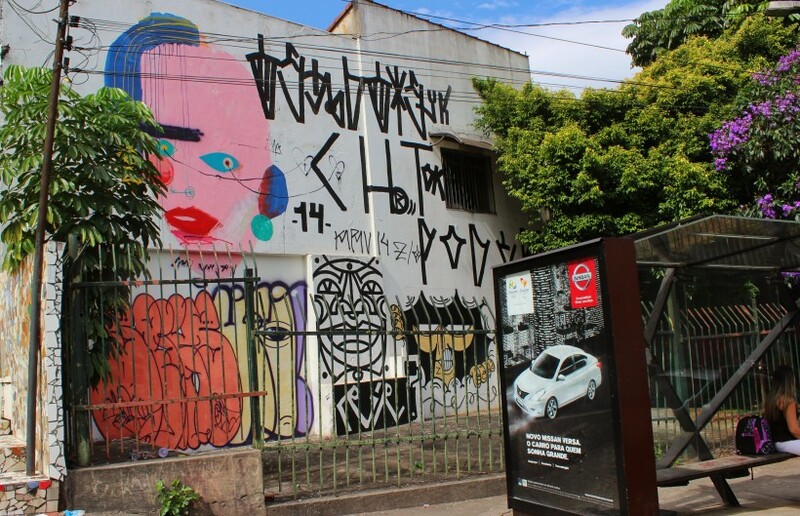 If you don’t have a lot of time in Sao Paulo there’s one neighborhood you shouldn’t miss, technically two, but they are mashed together – Vila Madalena & Pinheiros. 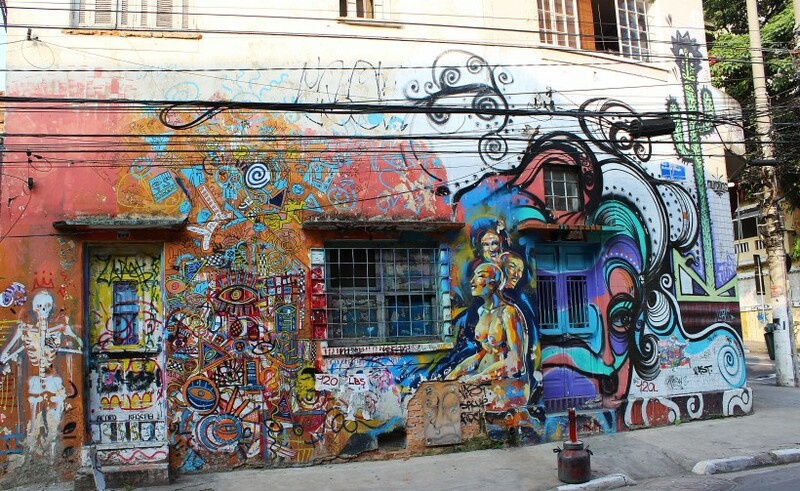 This is like a micro Paulista universe, where you can find just about anything that makes Sao Paulo charming! If you are on limited time, find a hostel or AirBnB here so you don’t waste precious hours in traffic. 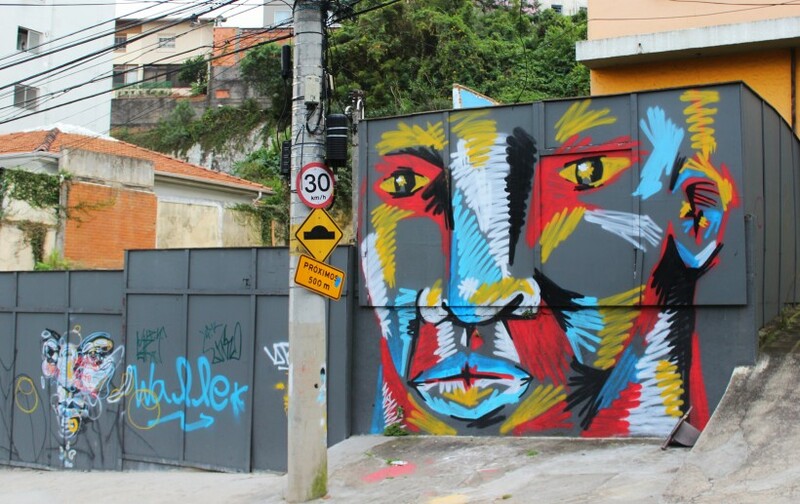 Anything around the triangle of subway stations Faria Lima, Fradique Coutinho and Vila Madalena is a great location. 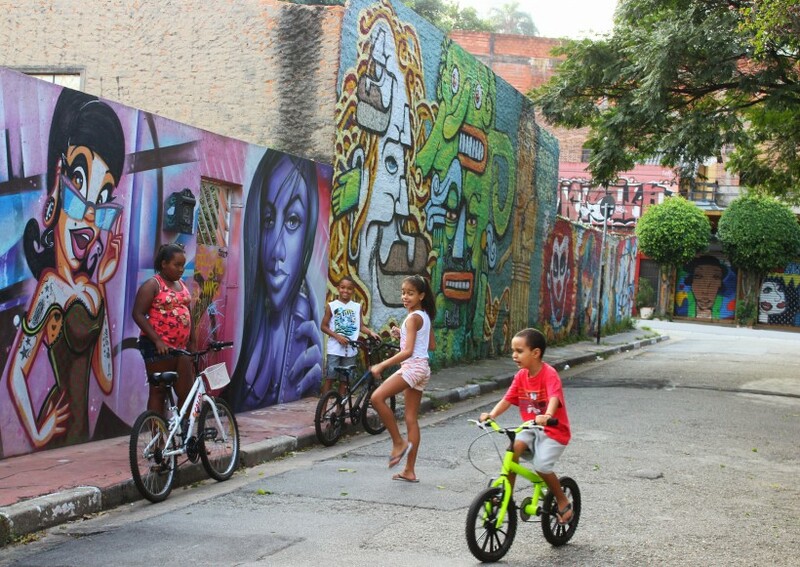 These two neighborhoods are home to great art galleries, bars, restaurants, cafés and some of the most amazing street art and graffiti I have ever seen. It’s super hilly here, there are loads of places where you can take staircases between different streets, but it’s very much worth it walking everywhere. Just so you won’t miss any great public space take overs, and you’ll end up with a great legs! 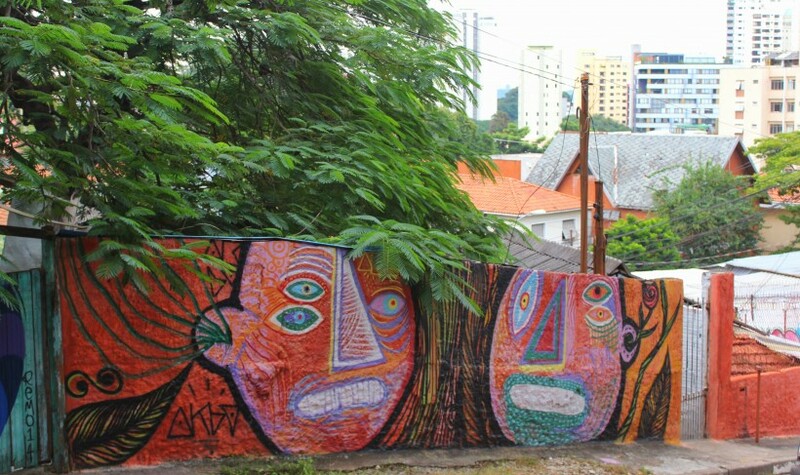 People in Brazil have a very high tolerance for art in public spaces, it’s part of the culture to have a colorful house, and it probably goes deeper than this, to times of political oppression only 30 years ago, where all you could do to be heard was writing or painting on walls. 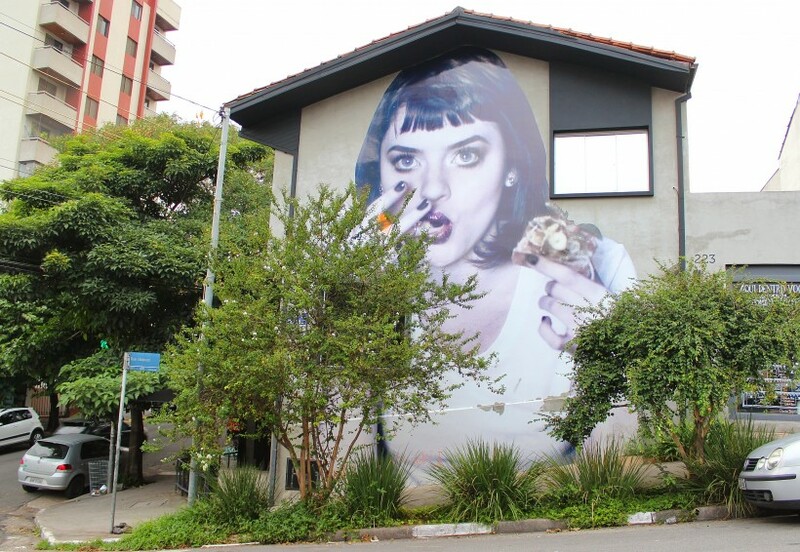 Nowadays, if you ask the owner of an empty wall for permission, they most likely will let you paint. 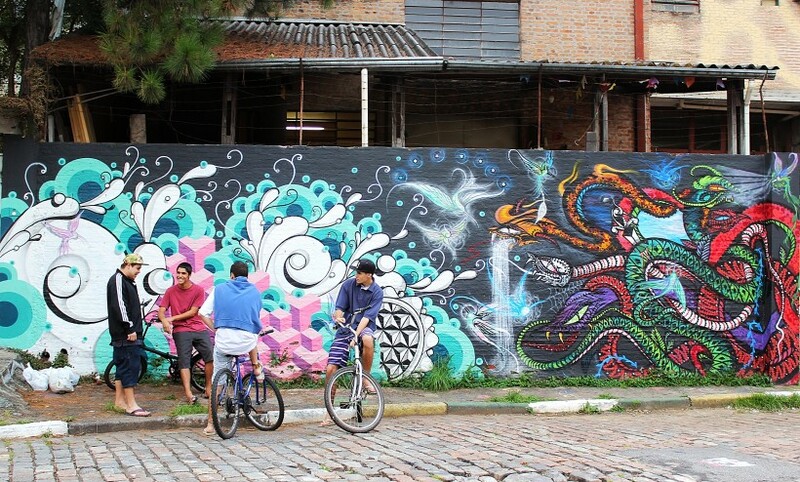 This gives for a very interesting mix of street art and graffiti, and evolution of both. Most people I hung out with paint illegally, and a lot, of course. 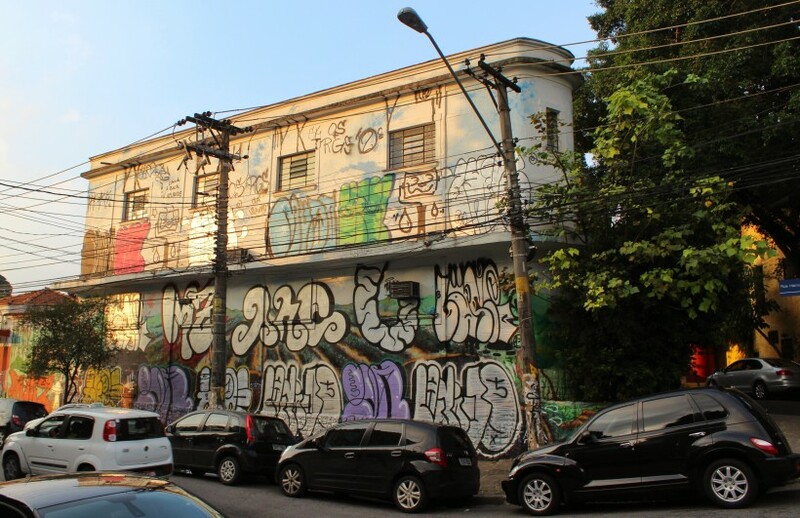 But this high tolerance in society has made this a fairly relaxed ordeal, daytime painting is not uncommon, and the only time you have to run from the cops is practically when doing serious bombing or Pixaçao. So, go for it! 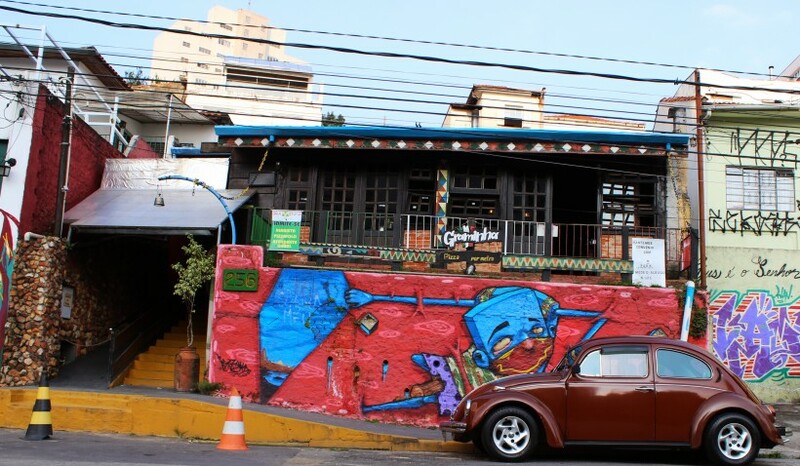 The area around the cemetery is full of small shops, cafés and art galleries. 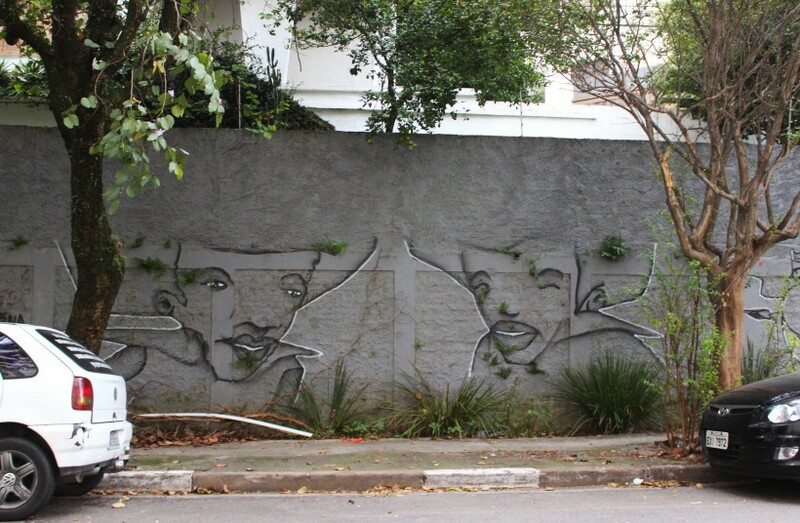 My favorite gallery is A7MA on Rua Harmonia, 95. 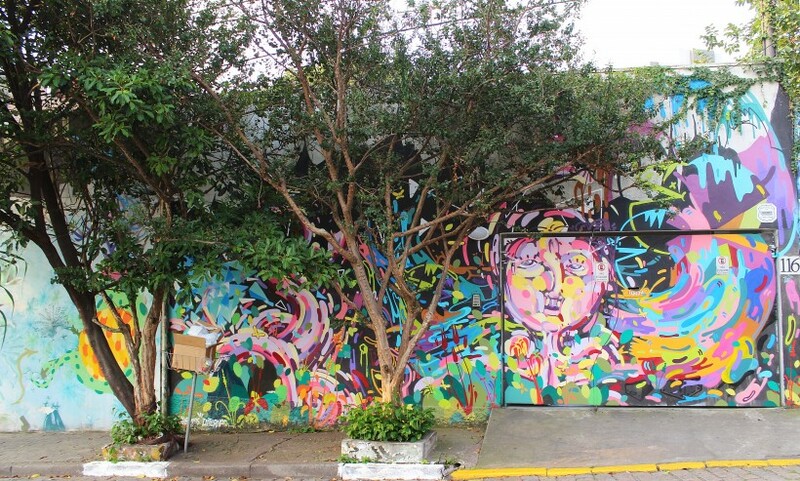 It’s home to some really great artists and has a super friendly atmosphere, go all the way back for hidden gems! 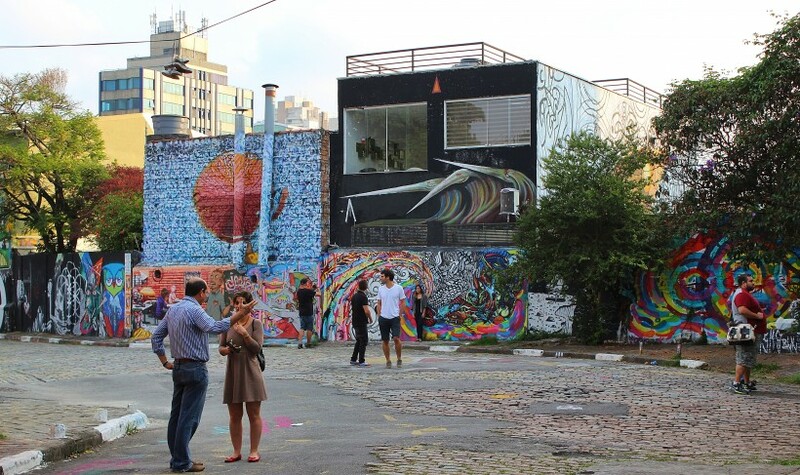 Right across the street you will find the famous Beco do Batman, an alley-maze completely covered in public space take over, breathtaking even for the most jaded, a visit here is a must. Don’t go on the weekend though, you won’t be able to see much for the hoards of people that come here to take selfies and wedding photos! 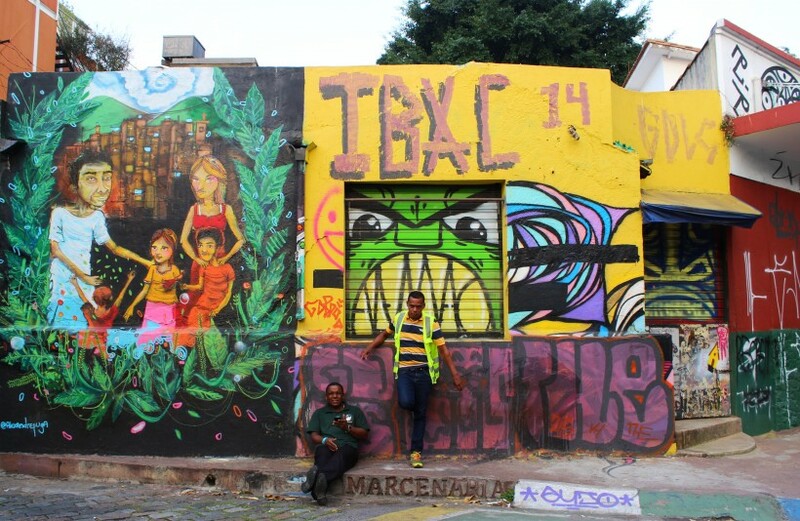 Beco do Batman, April 2015. 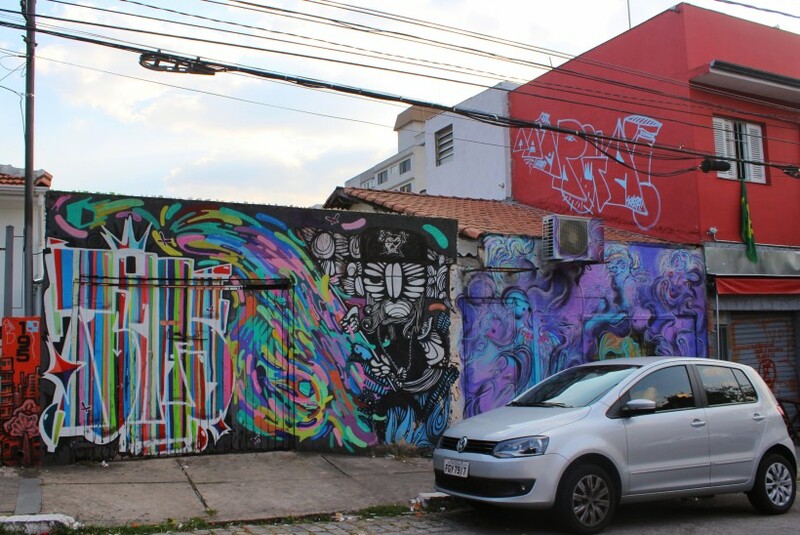 The streets around Rua Harmonia and Rua Mourato Coelho, from the cemetery of Sao Paulo and up, are full of bars, you can come here any day of the week and there will be loads of people drinking beer, hanging out or watching a football/soccer game on the TV. 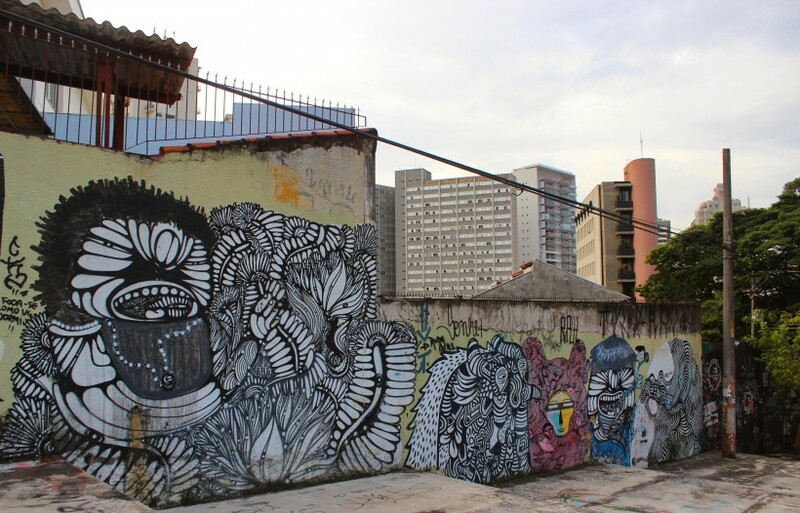 If you come on the weekend, any time after lunch, you will experience the amazingness of the Paulista public space take over – and not on walls. People take over the streets and the sidewalk, just as it should be! Why sit in a bar when you can take your drink and snack-food outside? So, everybody just hangs out everywhere, talking, flirting, dancing. It’s not uncommon for groups of samba drummers to practice on the streets, so join in on the dancing! 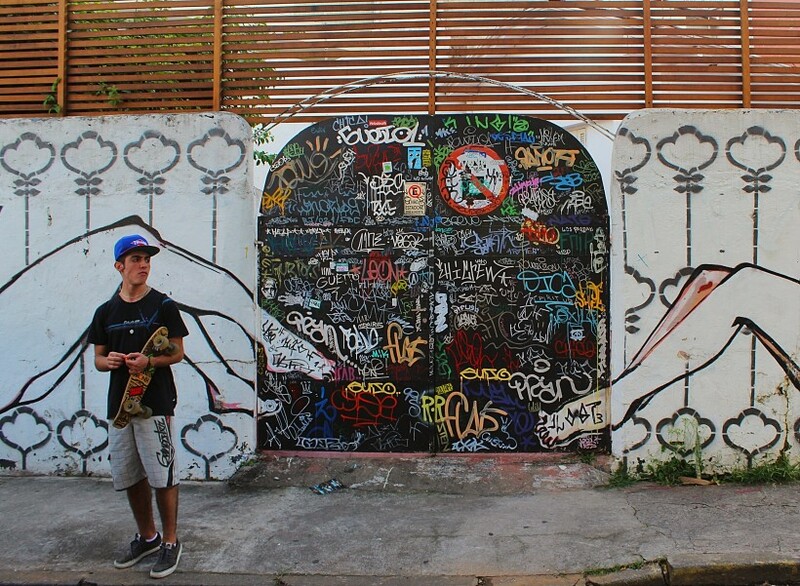 By the vintage market in Pinheiros, April 2015. 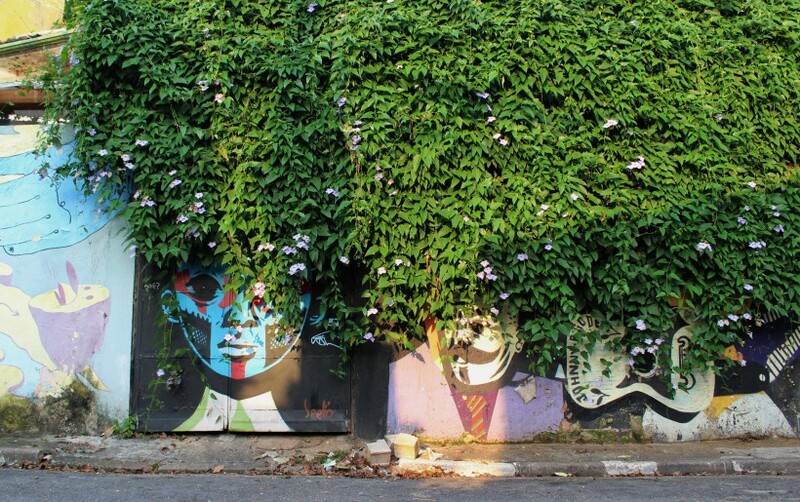 On saturdays, between 10-19, there’s a great antique and handcraft market in Pinheiros. For me, it was torture since I couldn’t buy anything because of my tiny backpack, but there’s also a food market in the middle so just the snacking was worth the visit – try tapioca, a gluten free pancake sort of thing filled with sweet or salty stuff of your choice- my favorite is coconut and dulce de leite! The market is on Praça Benedito Calixto, and passes right by a great restaurant/bar called Consulado Mineiro – they serve traditional food from the brazilian state of Minas Gerais, and it’s very good. If you’re not super hungry, at least try the fried Mandioca appetizer, chase it with a caipirinha, and enjoy the awesome vibe of the street take over! A little bit further up the same street, on Praça Benedito Calixto, 158 is a small gallery of stores with odd and special nicknacks, it’s 3 floors of jewelry, home decoration and vintage clothing, I loved it! The whole area down to Rua Artur de Azevedo and back up towards the cemetery is full of places to eat and drink, you will not leave here hungry or thirsty, promise! 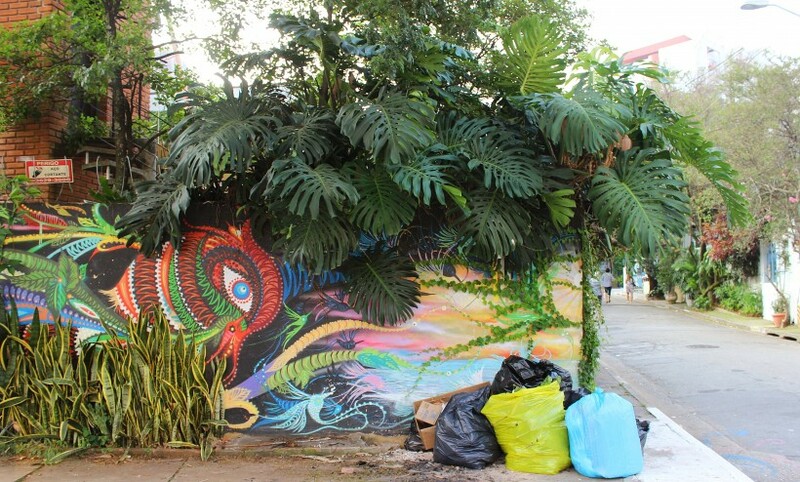 If you get off by the subway station Vila Madalena, you will go down towards the more lively area of Vila Madalena. 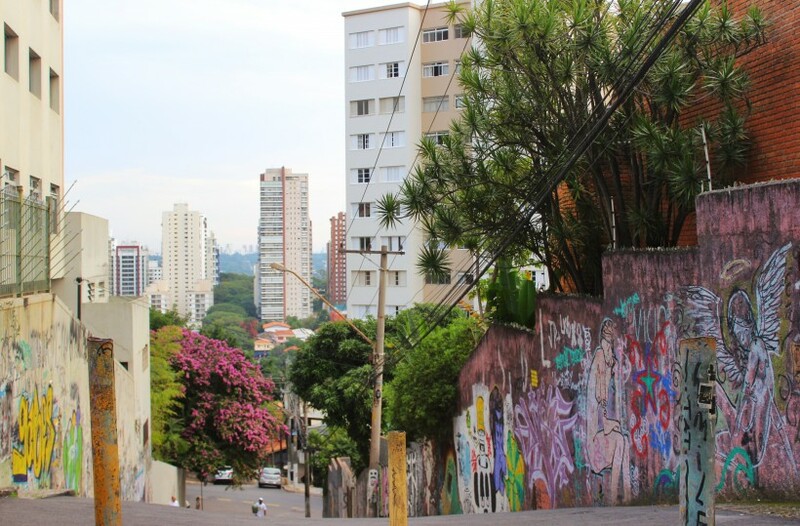 It’s a beautiful walk offering great views of Sao Paulo and serious walls and staircases covered in art. On the corner of Rua Rodesia and Rua Jericó is a lovely coffee shop, Vintage, where you have to try the sweets, they’re amazing! 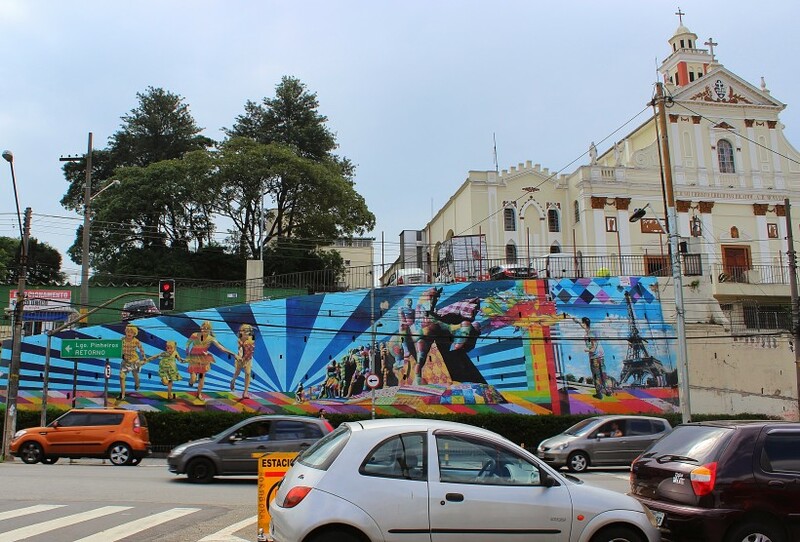 A couple of meters up the street is bar Mercearia Sao Pedro, another must try bar, and a bonus here is that across the street is a school surrounded by a completely covered in art wall! 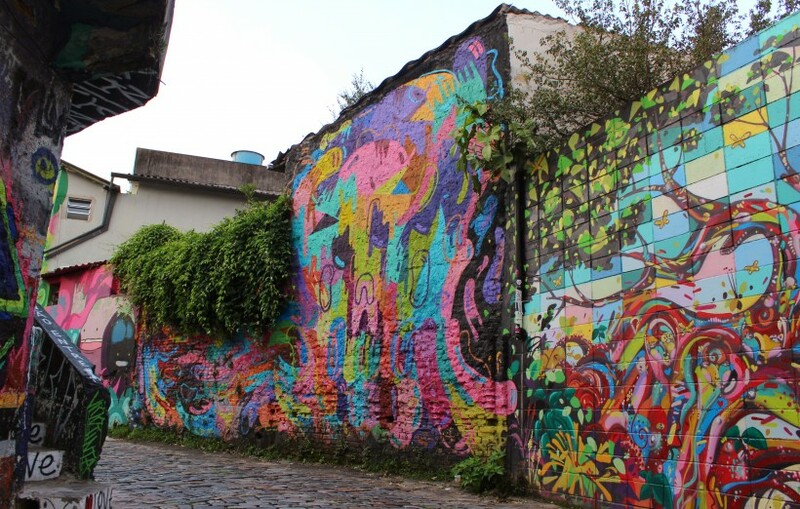 On the street Rua Fradique Coutinho that goes from the subway station with the same name in Pinheiros to Vila Madalena, there’s loads of bars, ice-cream places, cafés and everything else you might need. I loved Le French, on Fradique Coutinho 179. A lovely french inspired bistro, with the yummiest “French Toast” I’ve had outside of France! 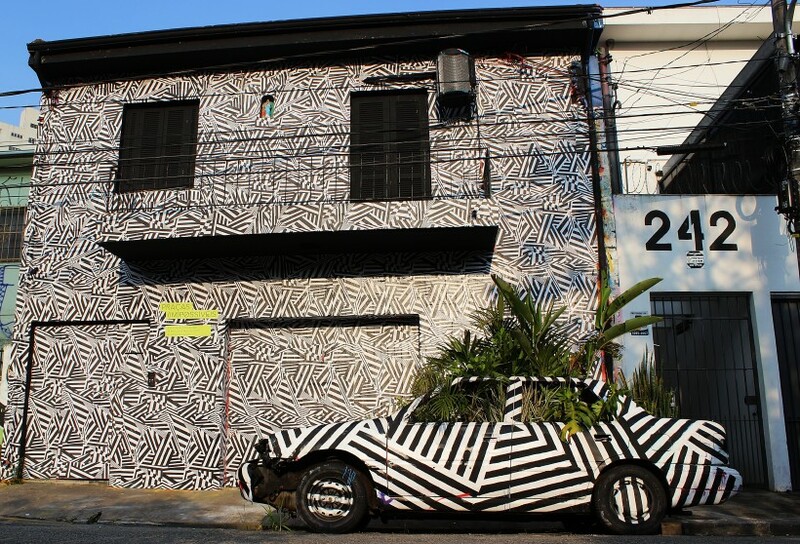 Enivo in Vila Madalena, April 2015. Peek-a-boo! Vila Madalena, April 2015. Throws and throws and throws! Vila Madalena, April 2015. Bombed door deluxe! Vila Madalena, April 2015. Public Space Take Over heaven! Vila Madalena, April 2015. Gorgeous mess! Vila Madalena, April 2015. 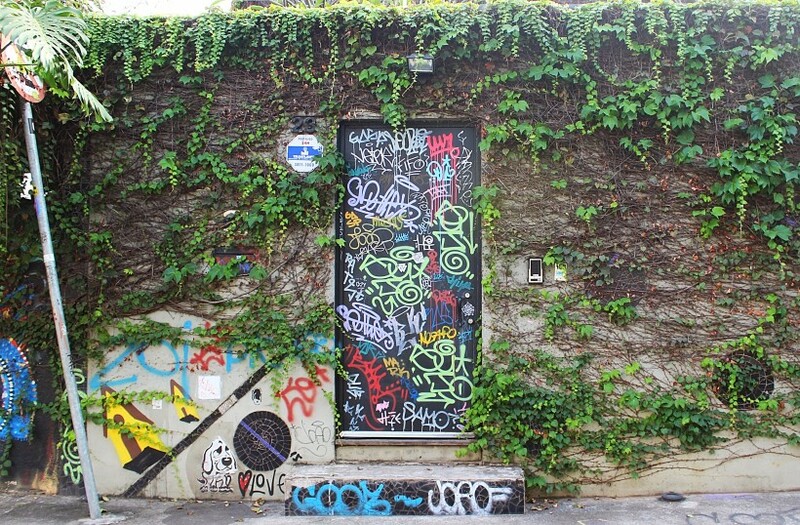 The bombed doors of SP… Love! 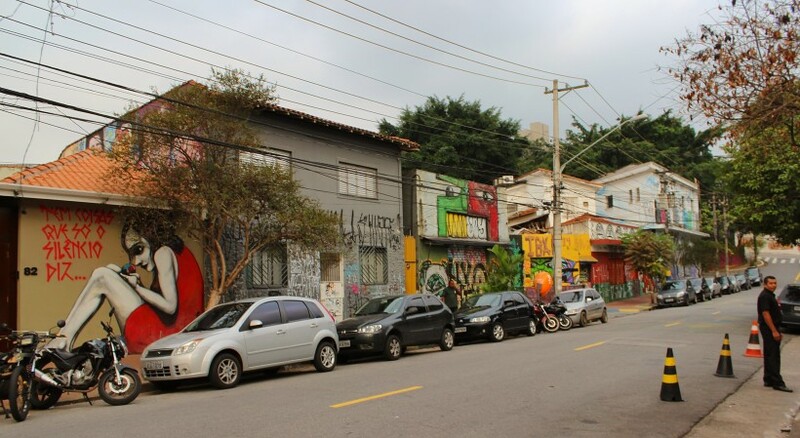 Vila Madalena, April 2015.